OUR MISSION remains the same. 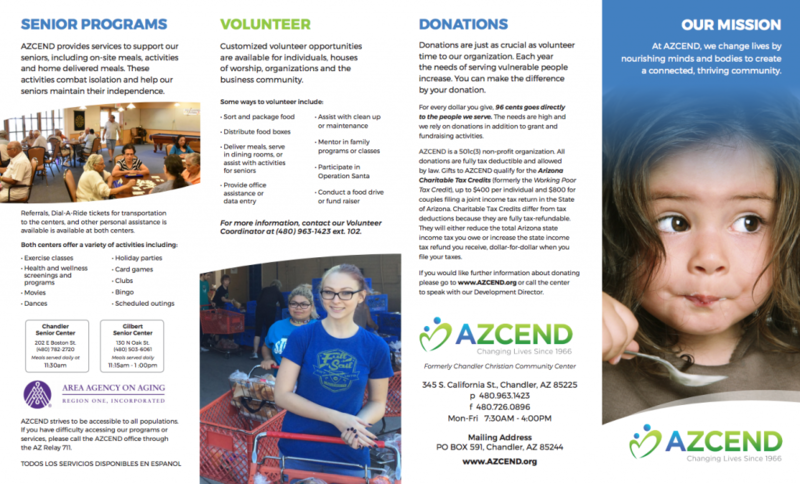 At AZCEND, we change lives by nourishing minds and bodies to create a connected, thriving community. Why change the brand after 50 years? Over the last five decades, Chandler Christian Community Center (CCCC) had outgrown our original name in several ways. Our services now extend beyond Chandler’s borders. We have multiple locations, not just one. We will always honor the Christian principles that led to the creation of CCCC initially. At the same time, we want to ensure that anyone in need of our services will get support. Why make the change now? We felt our 50th anniversary was an ideal opportunity to look back at the history that brought CCCC to this point, as well as look ahead to prepare our organization for the fifty years to come. As part of those strategic discussions, we realized that our organization had grown far beyond the boundaries of our initial name. We wanted to move forward under a new name and brand that would honor our current mission and allow for potential future growth. How will this brand change impact our donors and volunteers? This was our primary area of focus before the rebranding began. How could we position the organization for the future without alienating our individual, corporate and faith-based donors and volunteers that have made CCCC possible? The results of the survey were clear: existing donors and volunteers would not feel differently about our organization with a new name and brand. They would only feel differently if our mission changed. The only thing changing about us is our name, our logo, and our colors. Our mission remains the same as ever: we change lives by nourishing minds and bodies to create a connected, thriving community. Why did you pick AZCEND? Our deep 50-year roots in the Arizona communities we serve. Our goal of transforming and improving the lives of those in need. We want to do more than simply maintain their current situation—we want to provide them with the tools they need to change their lives for the better. What do the icon and colors represent? The icon is a stylized heart made of two intertwined individuals, underscoring the importance of compassion which is the basis of all that we do. The color blue is intended to represent delivering a sense of calm, peace or refuge in the midst of crises or uncertain situations. The green represents growth, the upward movement of the individual growing beyond his or her current circumstances with our assistance. Why remove Chandler from the name? Although Chandler is where this organization began, the need for our services and support extends well beyond Chandler’s borders. With our expansion into Gilbert and other surrounding communities, our goal is to be wherever the need is greatest. Does the new name mean we are dropping our Christian roots? CCCC was founded when a number of like-minded Christian churches in the area decided their abilities to serve the Chandler community would be most beneficial if they pooled their resources and worked together. That spirit of compassion and service remains at the heart of what we do and will do for the next 50 years and beyond. We will continue to work alongside all community partners to deliver the services with effectiveness, compassion, and respect. What was the process of changing the name and brand? Our Board of Directors hired an experienced outside branding and communications agency to lead the project. The process began with a substantial survey of our staff, volunteers, clients, donors, sponsors, organizations and churches to gauge what CCCC meant to them and how a potential rebranding might affect their relationship with our organization. Based on these findings, the agency and Board reviewed quite a few rounds of name ideas, ultimately narrowing the selections to a dozen. This list was provided to 20 marketing and branding executives across the US to determine what resonated best with experts unassociated with CCCC. Ultimately the list was narrowed to three, and a variety of potential logo and color palette treatments were explored, leading the Board to vote unanimously in favor of AZCEND. Before committing to the name, the Board engaged a local law firm to conduct a thorough search and ensure that no other entities in Arizona or across the US might have any legal claim to our name in the future. The CCCC staff then helped to finalize the colors and heart logo. The entire process took approximately nine months. We have been working with these same branding experts to ensure a seamless transition to AZCEND after our launch celebration on May 16. During the balance of 2017, you can expect to see references to CCCC in many of our communication efforts to ensure that all donors, partners, volunteers, community leaders and those in need understand that CCCC is now AZCEND. Where will the website be? The current website chandlerfoodbank.org will be permanently forwarded to our new website azcend.org to ensure that anyone looking for us on the web will easily find us.